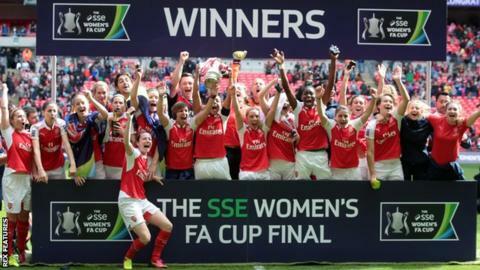 Holders Arsenal Ladies will host Tottenham in the fifth round of the Women's FA Cup when top-flight sides enter at the last-16 stage. Spurs, one of only two sides from below the Women's Super League left in this season's competition knocked out Brighton of WSL 2 on Sunday. There will also be a Merseyside derby between Liverpool and Everton, plus two all-WSL 1 matches. All the fifth-round ties are scheduled to be played on Sunday, 19 March. Champions Manchester City will host fellow-top-flight side Reading, while Notts County host Yeovil in the other all-WSL 1 meeting. Chelsea, winners in 2015, will be at home to WSL 2 side Doncaster Rovers Belles, while Birmingham City - who finished fourth in WSL 1 last term - will host West Midlands counterparts West Brom, who play in the third tier.